I've found inspiration for recipes from unexpected sources such as a novel, a television show and movies, but this is the first recipe inspired by a Twitter typo. Most Wednesdays, I post a regular feature I call The Feed, a collection of food-related stories from the past week that I thought were particularly interesting. To generate interest in the post and the included stories, I usually send a few tweets highlighting some of the stories. Last Wednesday, I included in The Feed Washington Post Food editor Joe Yonan's story on Chicken-Fried Cauliflower and NPR writer Dan Charles' story about asparagus. While I meant to tweet that Charles shared asparagus trivia, for whatever brain-dead reason I wrote, "@nprDanCharles shares asparagus cauliflower." Yes, "asparagus cauliflower." I was about to delete the tweet and correct it when New Morning Farm, my neighborhood farmers market, retweeted what I wrote, leading to an exchange between me, New Morning Farm and Joe Yonan about what to call this possibly amazing hybrid vegetable (we settled on "asparaflower") and Joe's great suggestion that it was "risotto time." Thus was born this spring risotto. Last Saturday, I paid New Morning Farm a visit. 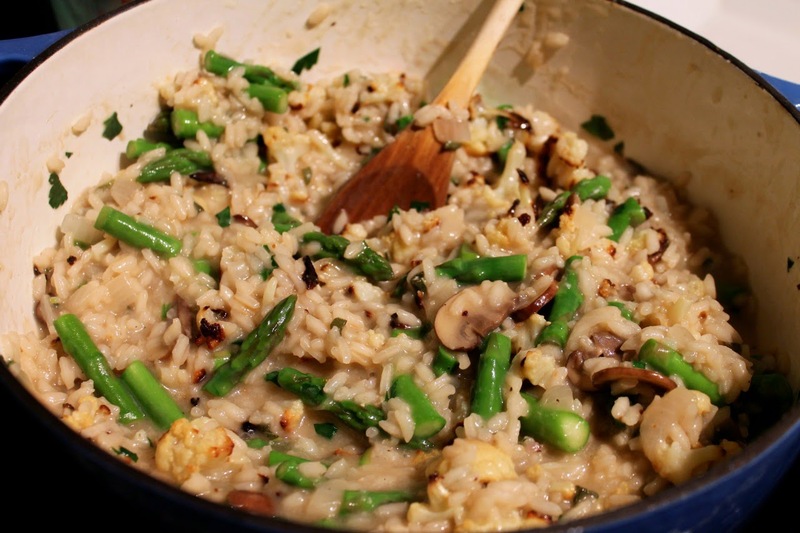 While they didn't have asparagus or cauliflower that day, they did have a great selection of mushrooms, which I decided to use both as ingredients in the risotto and its broth to add earthiness. I selected cremini and shiitake mushrooms. I decided to roast the cauliflower, since I love it that way, but to keep the asparagus pretty green, adding it toward the end so it cooks gently. 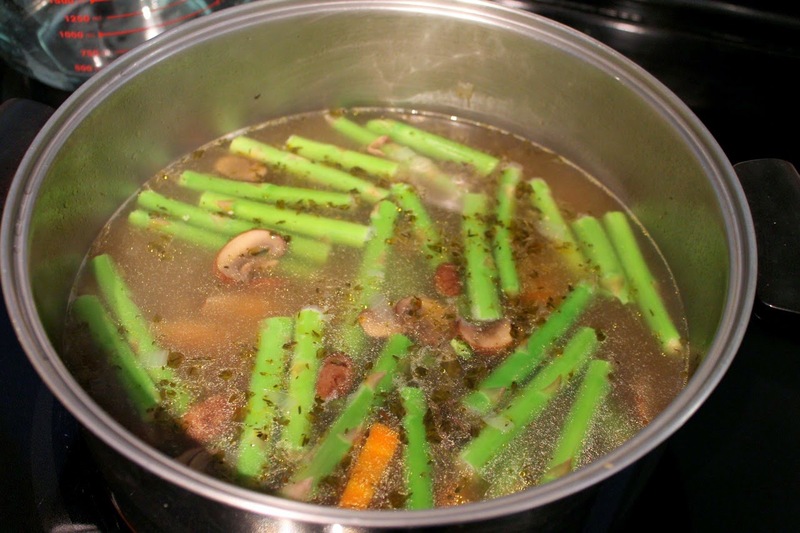 I also used the tougher asparagus ends that I normally discard for flavoring the broth. Although I could have used parmigiano-reggiano cheese for this, I instead went with pecorino romano, which I particularly like with brighter vegetable-based dishes. 1. Preheat oven to 425 F. Add cauliflower to a large bowl, drizzle with olive and a pinch of kosher salt and toss to coat with oil. 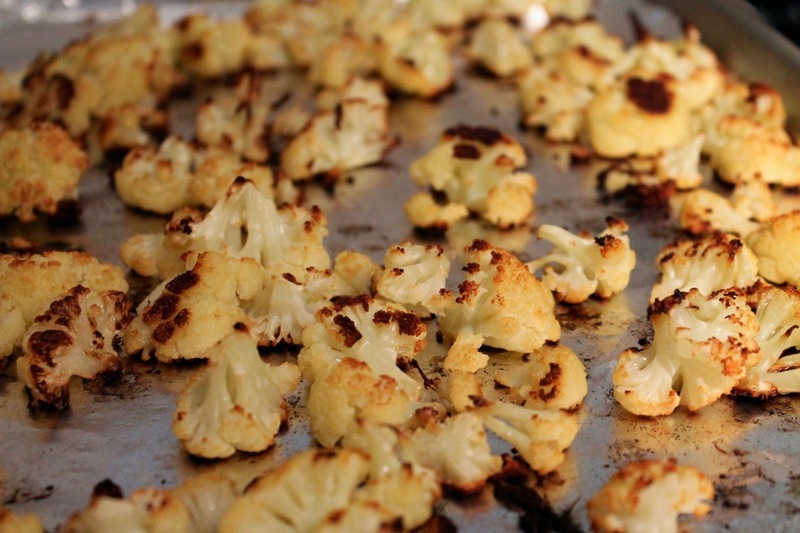 Spread florets on a baking sheet and roast for 20 minutes. Stir to turn florets and roast for another 20 to 25 minutes until browned and tender. Set aside. 2. Heat butter in a Dutch oven or large skillet over medium heat. Add onion and cook until softened, about 5 minutes. 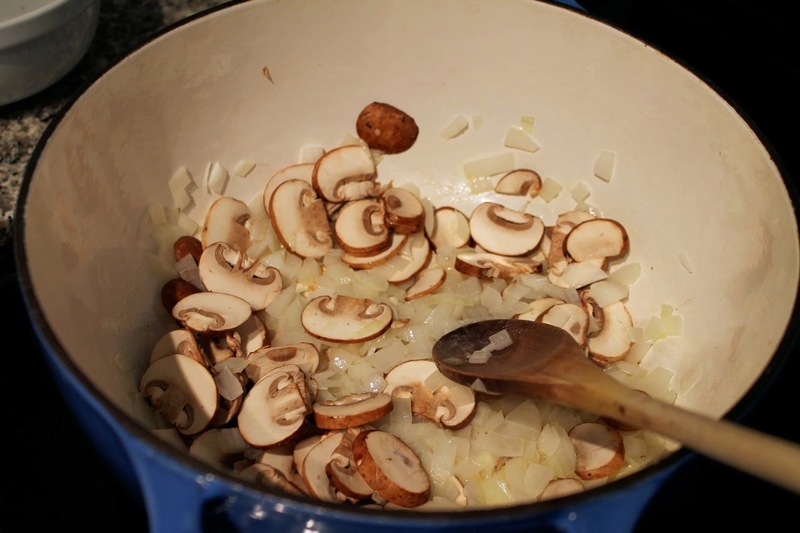 Stir in the mushrooms and cook another 3 minutes. Stir in the rice and cook another 2 to 3 minutes until the rice is lightly roasted. Add the sage and nutmeg and season with salt and pepper and cook just about another minute. Add the wine and cook, stirring occasionally, until the liquid has been absorbed by the rice. Add 2 cups of broth and cook, stirring occasionally, until the broth has mostly been absorbed, then add another 1/2 cup of broth. Repeat adding broth by the 1/2 cup and cooking until mostly absorbed until the rice is cooked through but still a little chewy (i.e. al dente). Stir in the chopped asparagus with the last addition of broth and continue cooking another 5 minutes. This usually takes about 30 minutes and you may not use all of the broth (I used a little more than 6 cups). Turn off the heat. Stir in the cheese and half the parsley. Serve the risotto in bowls topped with an additional sprinkle of parsley. Heat olive oil in a Dutch oven or stock pot over medium-high heat. Add onion, carrot, mushrooms and thyme. Season with salt and pepper and sauté until lightly browned. Add water and bring to a boil. Cover, reduce heat to medium-lower and simmer for 30 minutes. Add asparagus ends and simmer another 30 minutes. Strain out the vegetable solids. This was terrific. 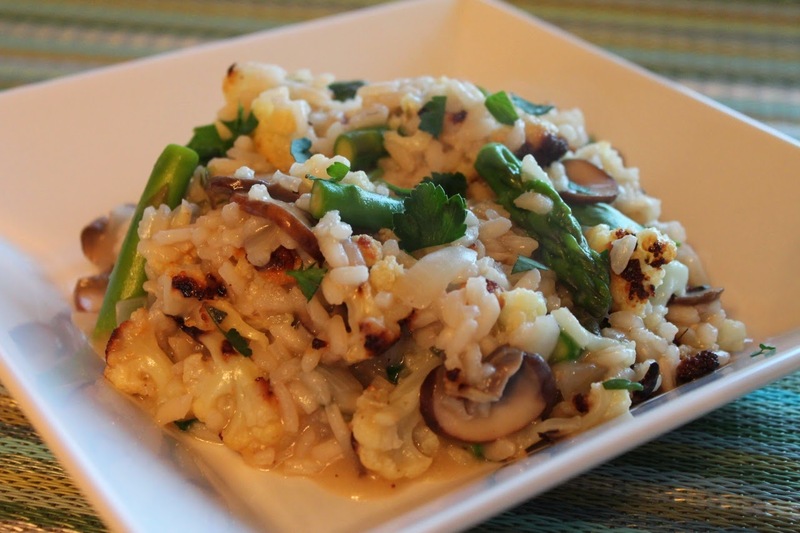 Your idea of bringing cauliflower and asparagus together with risotto is clever; all three go well together, along with the mushrooms. I suppose the lesson here is this: You should make typos more often. You're welcome! Glad it was a hit.